When I heard the news that Tinder's co-founders are suing Tinder's parent company (for $2 billion), I thought that would be the topic of yesterday's post. I reconsidered though because it's not really about products, and while it's a topic of interest in the tech world, it's hard to tell if the tech press is actually just making a meal of morsels. Still it was a big headline so I've continued thinking about it since then. Today a similar story broke, where FanDuel's founders are suing their acquirer, alleging the valuation was artificially depressed leaving them with nothing after the $465 million acquisition. These situations are not quite the same—different orders of magnitude in damages and valuations, as well as nuanced cases capturing sexual harassment allegations (Tinder) and changing regulatory climates around legalized betting (FanDuel)—but the same fundamentals do apply. The founders of both Tinder and FanDuel claim the companies owning majority stakes in their businesses purposely manipulated valuations to "cheat" them out of their fair "share." In Tinder's case especially, the founders created a very, very large amount of value for their shareholders, but they also knew the terms under which they were operating. Tinder was incubated at Hatch Labs, which was funded by IAC (Match Group's parent), so likely the founders were starting with less control and a messy cap table. By the time this lawsuit came around the founders hadn't been at Tinder for a while, with the exception of Jonathan Badeen. Similarly, the FanDuel CEO and co-founder left six months prior to their acquisition. It was probably very frustrating to see their companies create lots of value, and make others wealthy, while they were on the sidelines. Both of these cases will be interesting to watch for a couple reasons. Private market valuations are finicky. The cases hinge on the plaintiffs' ability to prove them. Further, it will be interesting to watch the founders go to war with companies they started and dedicated so much time and energy to over the years. No matter how these lawsuits resolve, it's unfortunate that everyone working on these products doesn't get to focus completely on the actual products for the time-being. I started using Pocket half a decade ago. By today's standards, that's a long time to use most non-social media apps. Yesterday though, the run ended as I switched to Instapaper and became a paying subscriber. I can't remember Pocket changing significantly at all over those last five years, other than being purchased by Mozilla. Perhaps that's the problem. It felt old, and my perception wasn't being delighted anymore. Instapaper seemed really fresh. Because they had been in the news recently (albeit for mostly unrelated reasons), I decided to take another look. When I started exploring Instapaper's features, all of them were clear improvements or additions over Pocket's feature set: Highlighting text, send to Kindle, no ads in the feed. I felt the same excitement about Instapaper that I did when I first started using Pocket. I get to carry around all these wonderful stories with me all the time. Near the end, Pocket became an article graveyard. I wasn't even excited to open the app to read these wonderful stories anymore. All that said, Pocket introduced me to the concept of read-it-later apps. (I never used Delicious.) And much had changed since I started using it. Today, the content I consume looks largely different along with my reading habits. I also have a Kindle. This combination of things could have been the main reason. Most likely these things were just the tipping point though. Pocket didn't do anything majorly wrong to lose me as a user. But, they did not do enough to keep me either. Is there any better time in history to be making a subscription product? Every major tech company (excluding Facebook, which is testing private group memberships) has deep roots in subscriptions: Amazon has Prime, Apple has the App Store, Microsoft has Office 365, and Google has the Play Store (Drive, YouTube Red, and several others). This isn't isolated to just the tech behemoths either—there are many types of products that are moving more towards subscription-based models, from clothing (Stitch Fix) to gaming (Fortnight) to meditation (Calm) and dating (Tinder). And they are working really, really well. Match Group reported rocketship Q2 numbers for Tinder with 3.8 million subscribers and is pace to 2x last year's revenue to $800 million. Netflix posted slightly disappointing result for the quarter, but still has 130 million subscribers, half of which are outside the US. RevenueCat, a company that recently launched from YC's summer batch, makes a developer tool that claims to make it trivial to add subscriptions to your app. I really enjoy the subscriptions I'm paying for. I used to look at subscriptions as a nuisance or as a sign that I was going to overpay for frozen value. Now they signal to me that I pay for the product to continue to get better. I subscribe to Prime, Spotify, Day One, Instapaper, Headspace, 1Password, Google Drive, and YNAB. I'm sure there are some that I'm missing, and some that I will invariably pick up as the year moves on, but wow these app are all so good. Oh yeah, and online journalism is viable again for the New York Times with a $24 million profit in Q2 in large part to—digital subscribers. Update: Apparently Apple invited 30+ app devs to a meeting last Spring to recommend they move from selling apps at a low upfront cost to a subscription-based SaaS model. Fascinating read! A few months ago, a couple friends kept insisting I try Notion. It almost seemed like a coordinated effort. But they were persistent, telling me how they used it for everything from organizing work to taming their personal lives. Managing my life in an app, or at least just jotting down notes, is never something that appealed to me. I need to ascribe specific, narrow purposes to the tools I use. Otherwise, it's hard to understand when to reach for one. Tools that try to do too many things often fall short of doing anything particularly well too. After using Notion, I'd still much rather keep taking physical notes, but it's undeniably an elegant product. It's very clean. You're welcomed by a simple homepage. They aren't begging you to sign up. They tell the story of Notion, and why you may be interested. 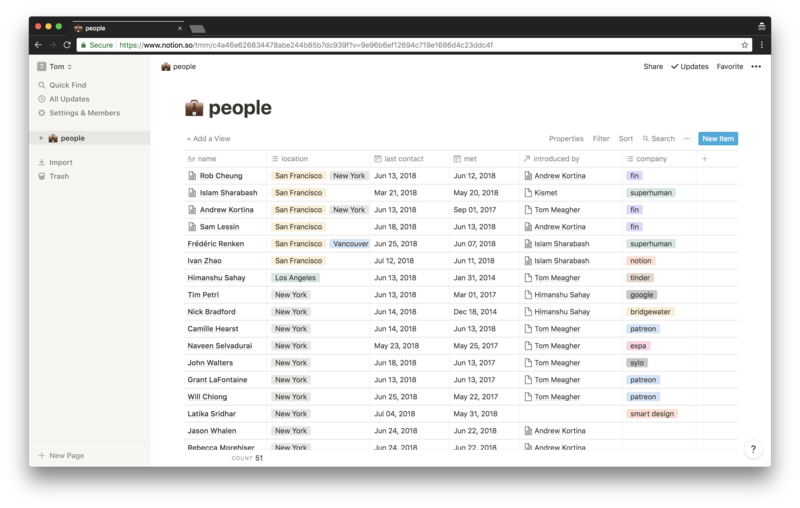 A few other nice touches are several helpful templates that get you started (including a personal CRM template), an offline mode that actually works, dark mode, and "/" commands that keep your hands on the keyboard. Plus, did I mention how clean the interface is? 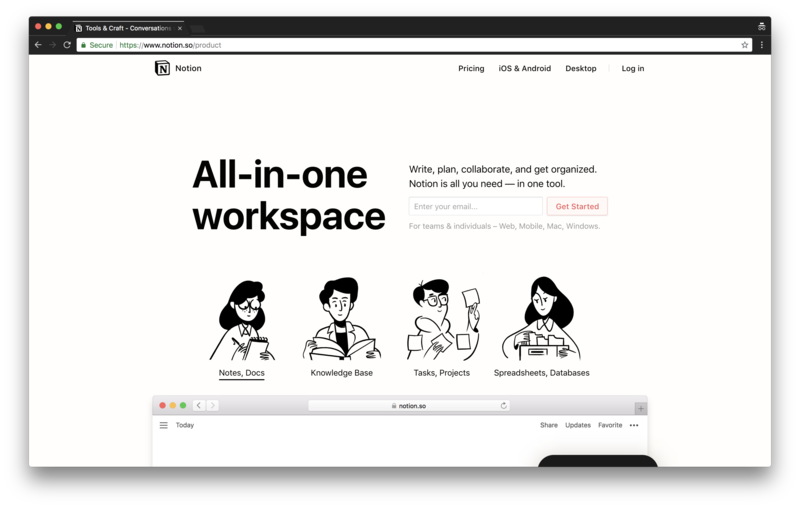 Notion is free to get started, and you only pay once you hit the free plan's cap of "blocks" or file storage. I'm not even close to the limit yet, but the pricing seems extremely fair. My two friends that use it, pay for it. They usually don't pay for stuff like Notion, using free alternatives instead. My one gripe is that while keybindings exist, they aren't very intuitive: cmd + p for search? Last time I was out in SF, I was fortunate to meet up with Ivan and the rest of the Notion team. We had lunch and talked about how they build products. Often you never get to see behind the curtain or meet the folks that make the tools you use. Meeting the team, I got a good sense that the product will always be clean and provide utility. They are all users of the product so I can see why my friends will continue to be too. I stumbled across Posthaven in the past—namely Sam's and Jessica's blogs—and didn't really know what to think of it. It's neat that it's "made to last forever," but the design was never eye-catching. Posthaven sites looked more like Blogger's of the early 2000s than Medium's trademark polish of today. They looked forever stuck between different versions of the Web. To it's credit though, Posthaven is pretty accessible: Pages are responsive, they load quickly, and there's not much in the way of others distractions or nefarious user tracking. All of these things made it the perfect place to set up (another) shop. Usually I publish at meagher.co. I like having my "own" space on the Web, and all the control that comes with it. Lately, it's been more of a crutch than boon though. You see, I like writing. I like the way I can take stuff out of my head and publish it out to the world. I like how the process really forces you to build upon ideas, see their flaws, and figure out how to communicate something to an audience—in the Web's case—you likely know little about. And so having my own space, where I have total creative control over everything, including the content, has become overwhelming. Whenever, I returned after not writing for a while, I would agonize over all the control. I would want to redesign the look and feel, spending hours pixel pushing. I wasn't doing any writing at all. I was too concerned about the packaging of the prose that all the worry left me without enough time or energy to do what I originally set out to. Writing is hard enough. Now that I'm committed to writing here, the other point of contention for me has always been what to write about. Older posts of mine focused on everything from generalizing the consumer tech industry, to code tutorials, to personal emotions/feelings. All of those things are "okay" separate topics, but when combined under one umbrella they cause confusion for readers—and the writer (a.k.a. me). It was always excruciating to sit down and figure out what to write about when I didn't have a theme. It meant that everything bouncing around inside my head was weighted equally. Oftentimes, that provided too much inertia to write anything. Or I would start. Then stop. Over and over again. I'm going to use this space to talk about things I really enjoy, specifically tech and Internet products. I love building them, testing them out, and talking about them at all hours of the day. I should be able to capture that excitement in writing to serve up here. That's my theme, and I'm sticking with it for now. Welcome to The Web's Grain, a place for candid discussion about tech and Internet products! I'm Tom Meagher (MAH-hur): a programmer, blogger, and walk enthusiast living in NYC. You can also find me at meagher.co.